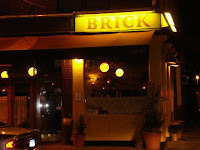 Brick Café brims with charm and is suitable for various social occasions. It’s great for a casual meal with friends or even a romantic dinner with your hunny. The inside decor is lovely--a cozy, dimly lit dining room with a multitude of wooden tables and sleek benches. Little details and special touches are peppered throughout this room, including anything from a vintage clock to the “worn” menus—designed to look especially “lived-in." Brick's extensive outdoor dining area also deserves bragging rights--you could see these tables from afar and they cajole you to stop in for a nice lunch or a cappuccino. The menu is easy to choose from and has a little bit of something for everyone. All of my visits to Brick include an order of the piping hot onion gratinee soup—the croutons are big and spongy and the gruyere dutifully sticks to the side of its dish. The seafood is also delicious and offers up a healthier alternative. I especially like to get the marinated grilled calamari with arugula and tomato salad--it's very refreshing and leaves you feeling guilt-free. 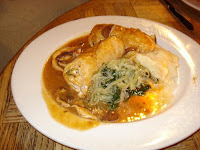 Their chicken and pasta dishes are also yummy, although probably not as light on the calories. I haven’t tried Brick’s brunch yet but I’d definitely give it a shot based on my previous dinner experiences. I like the service at Brick and the handsome waiters are definitely a plus. Even though they occasionally leave me waiting, it’s never for too long. 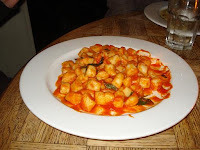 I also like coming here for the reasonably priced dishes—appetizers range from $4.95 to $13.95 and entrees are generally in the neighborhood of $16.95. Another positive aspect of Brick Cafe is that the waiters will not kick you out if they catch you pouring from your personal flask into the diet coke you were just served! On a serious note, I just enjoyed a lovely dinner with the girls, and I plan to take my hunny there for a romantic evening in the future! We have eaten here several times. The food seems to be above average, but the drinks are top notch.